Quantum Rehab/Pride Mobility Products Corporation’s Education & Technical Training team is committed to developing and providing quality continuing education opportunities for professionals in the rehabilitation industry that reflect the latest technological advancements and standards of practice. The Education & Technical Training Team upholds the highest levels of professionalism and provides continuing education activities that are comprehensive, objective and absent of any conflicts of interest by the corporation, its principals or its instructors. Pride Mobility Products Corp. has been approved as an Accredited Provider by the International Association for Continuing Education (IACET). 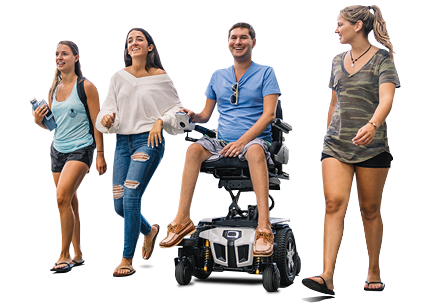 In obtaining this accreditation, Pride Mobility/Quantum Rehab has demonstrated that it complies with the ANSI/IACET Standard which is recognized internationally as a standard of good practice. As a result of their Accredited Provider status, Pride Mobility/Quantum Rehab is authorized to offer IACET CEUs for its programs that qualify under the ANSI/IACET Standard. As an IACET Authorized Provider, Pride Mobility/Quantum Rehab offers CEUs for its programs that qualify under the ANSI/IACET Standard. Provider # 1307743. Valid through 2/28/2021. If you don’t see what information you want or need, or have questions regarding an upcoming continuing education or training (CE/T) activity (i.e. seminar), your registration for an upcoming CE/T activity, technical support questions, or any general questions regarding continuing education requirements/guidance, please feel free to contact us. You can submit a quick note by clicking here and allow us to repond to you via email or phone. Specific questions regarding seminar registration/cancellations, past continuing education history, CE transcripts and certificate reprints.